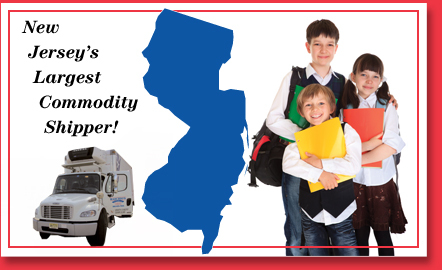 Commodity Shipping for State, District and Regional Schools. Temperature Controlled Trucks with GPS tracking. We provide moving equipment and personel. Shipping Scheduling and Managing services. Partners with New Jersey School Nutrition Association. 100% compliant with Federal and State Department of Transportation regulations. Our newly equipped temperature controlled trucks service more than 200 schools state wide weekly with exceptional service.